This course takes its approach from the context of the shared studio-base arts university where all courses are making. 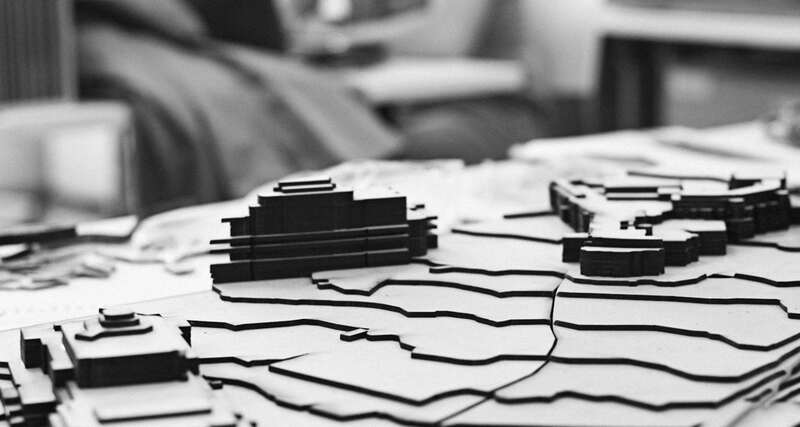 The Master of Architecture courses apply this philosophy throughout their taught units by emphasising the role of drawings, models and texts in the making of architecture: the things we make – to think about the things we make. As a student you’ll be asked to develop projects with strong narratives commenting on current social, cultural and environmental issues. In each unit you are encouraged to give architectural expression to your own personal views and visions, whilst aiming to produce tangible propositions, mindful of how they might be realised. The Studio is both professional and exploratory: this educational experience is grounded in a strong studio culture of making and thinking, supported by regular lectures by practitioners, seminars and reviews. The studio generates an atmosphere in which open, critical and reflective practice supports exploration and risk taking. AUB has a particular concern for a studio-based and student-centred learning environment. The studio generates an atmosphere of creative exploration and critical debate where we test, discuss and present ideas. AUB offers shared facilities such as the workshop, fab-labs, the print room and the Drawing Studio, opened in 2016. At AUB, the collaborative works both across the distinctive arts context and the wider world; various collaborations stimulate the student’s particular architectural direction. Located within a specialist art, design, media and performance institution, the course offers you the potential to study alongside other creative and cultural disciplines and to determine your individual emphasis of practice through interdisciplinary collaborations, both formally and informally. AUB supports strong links with professional practice and industry. The course has strong links with local and national architectural practices and RIBA Dorset. The course also has European and international links. Regular contact and visitors from practice and construction and the ARB and RIBA keep students informed of trends and changes in the world of practice. The urban density of the AUB campus has seen the insertion of a Drawing Studio by Professor Sir Peter Cook. This RIBA award winning building was opened by Zaha Hadid. Her practice is now closely involved with the development of Pavilion Gardens in Bournemouth and the MArch course is shadowing this work. You may also collaborate with external clients and manufacturers in live projects and international collaborations such as the Venice Biennale (with the MArch Venice Biennale British Council Fellowships). The course will support your personal development towards a creative contribution to architecture and the wider world after graduation. The final Thesis Design year gives you the opportunity to develop your own research design project that integrates making and collaboration through an ecological narrative.